The goal of this lesson is to remove coordinates from one array while appending to another. Sometimes you'll want to use an item that you remove from an array. Unfortunately, a removed item is stored for a short time, so you can assign it to a variable or append it to another array. In the code above, the coordinate appended to newArray is the one that is also removed from rightColumn. You may have noticed that rightColumn is initialized with a method. The world instance includes a set of methods that let you quickly create an array containing all coordinates in a column or row. 1. Create one empty array of coordinates, and use a method to create another array of all coordinates in row 2. 2. Each time the outer loop runs, remove an item from the array and append it to your empty array. 3. Iterate over your empty array, placing an instance of type Character at each coordinate. // Create an array of all coordinates in row 2. // Create an empty array of coordinates. // Remove a coordinate and append it to your empty array. // Place a character for each coordinate added to your empty array. 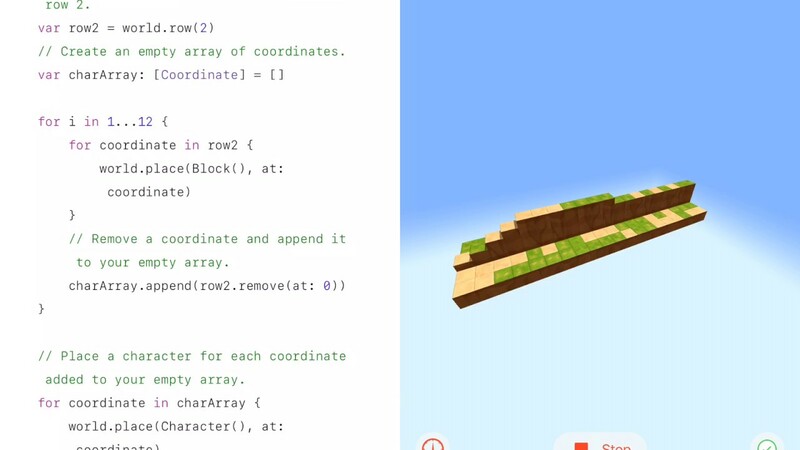 Next we will be looking at Fixing Array Out of Bounds Errors.